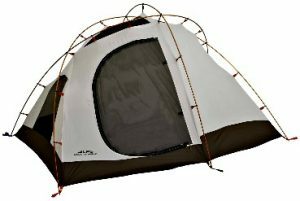 Alps Mountaineering Extreme 3 Tent Review - From $173.20 ! Alps mountaineering extreme 3 is much more than just your average 3 person tent. Its an extreme 3 person tent people and what that means is this; this tent can width stand storms that most other tents would not. The 3 pole design is spectacular especially when we consider the size of this model. It gives you more scope to deal with what mother nature has to offer and does so by giving you more comfort and sturdiness at the same time. Alps extreme 3 fits three easily you could probably have room for a fourth too. Where you would come undone however the vestibule size is. You only have two. Which isn’t a big deal itself but when you consider you have three people in the tent and two people have their own vestibule space what is the third person going to do? Extreme 3 comes with 2 massive upgrades. The first is the over sized #10 door zippers that make opening and closing the flaps absolutely easy no matter what the weather conditions are like you are not going to let these clip through your fingers. Also the heavy duty nylon oxford floor is also great because it increases the durability of the tent tenfold. The mesh walls are great too because they keep insects out but keep the cool air ventilating throughout. The upgraded heavy duty nylon makes any weather not really an issue when it comes go planning a camping trip with Alps mountaineering extreme 3. It’s practically indestructible no amount of rain, sleet or snow could penetrate the outer walls of this monster. It is also worth nothing that the 3 pole frame is also very good at keeping the tent upright and protected. The fly buckles provide better more secure attachment when compared to what these tents usually use- an elastic cord. Rugged, big and heavy. You do not want to carry this tent over long distances on your back but it really is meant for three people. Campers on their own will not need a tent this big and bigger families or groups tend to only go camping in mild weather so the rugged build of this model isn’t really required too much. Alps mountaineering extreme 3 is still one of the best 3 person tent, does everything it needs to and is worth the money. Alps mountaineering extreme 3 comes in a three color scheme tan mixed with green and then more tan and a little black. Its very basic but consists of the three main camouflage colors so hunters or trackers would absolutely love the color scheme of this tent. Great for blending in. Doesn’t stick out too much so if you were at a festival or concert you wouldn’t be able to pick it out from the crowd. Nothing is going to blow the Alps mountaineering extreme 3 tent away of knock it down. Rugged, built to last and lots of space. The upgraded nylon makes it even heavier and we aren’t really sure why, the flooring on the other extreme models seemed to work fine. The serious camper isn’t going to want a big spacious tent that is really heavy and easy going campers are not going to look to go out in terrain and weather where they are going to need such a big, bulky framework. It just seems unnecessary and above all else its heavy.